Ten years ago, on 14/15 Aug 2007, on the 60th anniversary of India’s independence, PTI London released a piece of fraud news. All major newspapers in India prominently carried it, Hindustan Times on the front page, The Hindu on the back page etc. 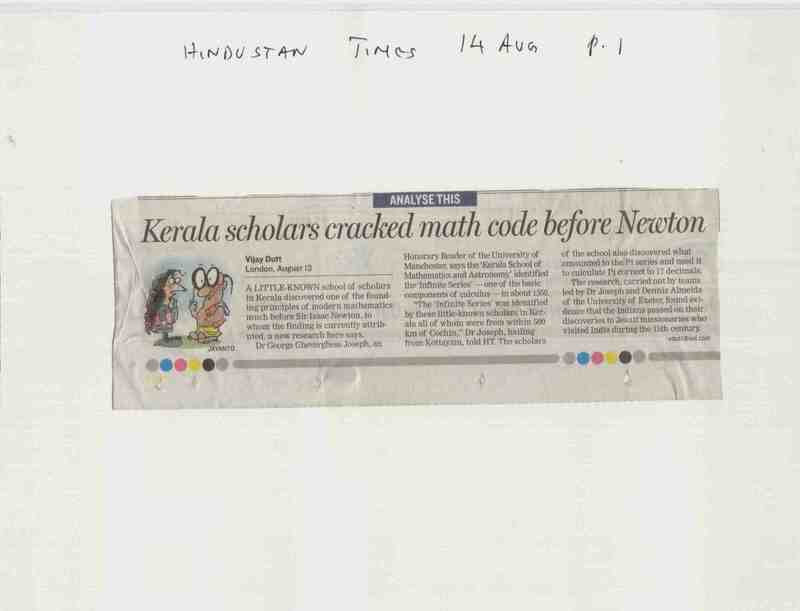 According to the news, two British researchers from Manchester and Exeter universities had established that the calculus developed in India before Newton. But they added that this left Newton’s greatness unaffected. The news was based on a press release posted on the Manchester university website (now removed from its site, since it was a fraud, but archived here). The news was also carried internationally, for example, by the London Telegraph. I phoned them, and pointed out that I had recently published a whole book dealing with the transmission of the calculus. Cultural Foundations of Mathematics (Pearson Longman. 2007). The subtitle of the book itself said this: it was “The nature of mathematical proof, and the transmission of the calculus from India to Europe in the 16th c. CE”. The book emphasized the development of calculus in India with a different philosophy of mathematics, and its theft by Cochin-based Jesuits. This theft of knowledge was carried out to solve the major scientific challenge then facing Europe: navigation. But, after stealing it, the same churchmen wrote utterly false histories glorifying the West by claiming that Newton and Leibniz invented the calculus. Colonialism was built on this false history, not any technological superiority, as I have explained elsewhere. My calculus book was the culmination of a ten year effort since 1997, partly funded by two agencies: the Indian National Science Academy since 1998 (Project on Madhava and the Origin of the Calculus), and the Project of History of Indian Science, Philosophy and Culture, with which I was associated since its inception in the early 90’s, but accepted an Editorial Fellowship only in 1999. The 500-page book (an authored volume, not an edited volume) was the 50th volume in the PHISPC series. When I brought this to the notice of the London Telegraph they said they had not checked the news, and removed the fraud news item from their website. In Hindustan Times the front page news carried the signature of Vijay Dutt their London correspondent. I contacted the HT office, and further pointed out that one of the purported authors of the Manchester paper had been earlier involved in plagiarising my work and warned in 2004 by Exeter University. The HT had given prominent coverage to that news in 2004. After he was caught for plagiarism, and expelled from Exeter, Dennis Almeida had even submitted an apology. Shortly before the fraud news blitz, Almeida had submitted a second, signed apology. I passed on all this material to the HT London correspondent who investigated the matter following which the HT realized the Manchester university media release was a fraud, and published a retraction. The lesson is that those who forget history are condemned to repeat it. We are so proud of having developed the calculus, but was it not a great shame that we forgot the true history of calculus development in India, until I first brought it out? Because we forgot, the thesis of calculus transmission developed in my book was itself stolen repeatedly. This theft was supported with the help of fraud news, planted by George Joseph through Manchester University. This was not a one-off affair. These pre-planned attempts to steal credit for the calculus transmission thesis had been going on since my book on calculus transmission was conceived, and they are partly described in the book itself in a section on the “Transmission of the transmission thesis”, and in more detail in the chronological section below. If we forget that the West steals knowledge they will keep stealing it. The fraud news blitz, planted through the machinations of George Joseph and his accomplices, has never been adequately publicly denied. Such denial is necessary since the news item survives on the Internet, and people still keep getting misled by it, and the fraudsters continue to benefit. Telling the truth about such fraudsters and their antics is also the only way to stop such repeated thefts of history. Second, colonially educated Indians are taught to trust the West as a reliable source. This trust is what enables Indians to be repeatedly conned by Westerners. Indians need to understand the unreliability of the West. Third and most important, correcting credits is not merely a matter of cultural pride. Thieves distort what they steal, for they are ignorant people. So, they make mistakes exactly like a dishonest student (who cheats in an exam, and copies from a more knowledgeable student) makes mistakes even while copying. Unlike cheating in an exam, the theft of history, and the resulting mistakes, impact others. For example, just because the calculus is falsely attributed to Newton and Leibniz we teach calculus badly today as it was (mis) understood in the West, and not as it developed in India. This impacts the lives of millions of our children who find math difficult as a result. That is, because of the false history of calculus, millions of children are condemned to a bad understanding of mathematics today. Restoring credit to the original also helps us to isolate Newton’s conceptual misunderstanding of the Indian calculus and the conceptual error that this created in his physics. It helps to do better science today. All this value (easy math, better science) is lost due to misplaced credits. What mistakes did George Joseph and Dennis Almeida make? They made plenty. Some are clear from the news release itself. For example, they understood only regional chauvinism. They made out the Indian calculus to be solely a product of Kerala, when in fact, as explained in my book, it originated in Patna, in the 5th c., with Aryabhata, a lower caste person. The Kerala school certainly developed it further (and these highest-caste Brahmins from the south, such as Nilakantha Somasutvan, had no difficulty in honestly calling themselves disciples of the low-caste Aryabhata from the north). Even the later achievement of Madhava involved essential inputs from Narayana Pandit of Benaras, as explained in my calculus book. That is, the Indian calculus was a pan-India development, and NOT a product of the Kerala school alone. But, this important story of national integration across regions and castes, in pre-colonial India, is lost in the story of regional chauvinism personally profitable to the thieves who did not understand the subtleties of what they stole. Further, if we teach the Indian calculus today in universities (as I do) the focus will be only on what Aryabhata did. So, the plagiarists’ false understanding of history also prevents us from reforming calculus teaching today. Neither of the plagiarists understands the calculus well enough to teach it. To summarise, it is important to make the true facts known (a) because the truth must be told (b) also to avoid constant repetition of such thefts of history by the West, (c) the truth must also be told about the constant treachery and duplicity of the West, which we are wrongly taught to trust, and which misplaced trust (d) ultimately causes great damage to our education system and the minds of millions of children, and (e) results also in a false understanding of contemporary social problems, apart from (f) bad science. Specifically, the matter is not about plagiarism alone, it is also about cultural theft, a very dirty kind of theft which damages the culture and the people. The severest punishment should be given to the perpetrators of such cultural theft to prevent this sort of crime from being committed again, for such cultural thieves cause far more damage than the criminals who steal archaeological resources like idols. We must recognize the theft of history as a grave crime, and condemn the repetition of these crimes. We must condemn also the support offered to these crimes by prominent Western universities and demand reparation. The Manchester media release (now removed, but archived here) had said that an unpublished paper was available to back its news story. That by itself is laughable. Anyway, I obtained a copy of this unpublished paper from Manchester university (hereafter called Manchester 2007) This unpublished paper was almost totally plagiarised from a paper I had written in 1999, in two parts (part 1 and part 2). The two parts combined are hereafter called Trivandrum 2000. They were submitted to a conference in Trivandrum organized by George Joseph in Jan 2000. As a key organizer of the conference, George Joseph had privileged access to the paper which trust he betrayed to steal the paper. The Manchester 2007 paper verbatim copied large chunks of my Trivandrum 2000 paper, and the main significant novelty in it was the change of the name of the author: it excluded my name and included the name of George Joseph as an author! This was done in a roundabout way by stating the fake author’s affiliation to Manchester university in the paper, and giving their names in the accompanying news item. The reason for this roundabout way will become clear later on in the chronology section. Because Manchester 2007 was essentially the Trivandrum 2000 paper, in my style of writing, it cites 6 of my unpublished papers (Yutkibhasa,1 Kamal,2 Sunya,3 China,4 Hawaii,5 Euclid6), unpublished as of 1999, but all published as of 2007. These plagiarists are such terribly bad scholars, who thought only of changing the name of the author, that they forgot to cover their tracks. So, the six papers are still cited as unpublished papers, in Manchester 2007! (And similarly cited as unpublished in the published version of Trivandrum 2000 paper, which paper was published illegally and unethically without my knowledge or consent or copyright clearance, in the proceedings of the Trivandrum conference (hereafter called Trivandrum 2003). However, several passages in Trivandrum 2000 were already fully published earlier under my name. Thus, in 1999, I submitted a paper to a major international conference in Hawaii, in Jan 2000, to which I was invited to deliver a plenary address. The paper created a strong impact, and it was one of the few papers in the conference published in 2001 in Philosophy East and West (Hawaii paper). Some immediately relevant parts of the Hawai’i paper are posted here. The most superficial examination shows that the Manchester 2007 paper copies shamelessly from the Hawai’i paper. Some examples of how the Manchester 2007 paper does cut-paste copying from the Hawaii paper (1999, published in 2001) are given here. Some of these citations, copied from my paper, involve references to original sources in Sanskrit which neither of these plagiarists understand; some involve sources to which they had no legitimate means of access. (They could have accessed those sources only through theft.) The manner of some citations (e.g. of the Sunya paper, cited as “summary of interventions”, instead of “paper presented”) is something which neither of these two could have known, for neither was present at the Sunya conference, so how could they know that my paper was prepared only after the conference? The other important point to reiterate is that this was not the first time that my calculus transmission thesis was plagiarised by George Joseph and Dennis Almeida. A summary table of the serial plagiarism by George Joseph and Dennis Almeida is available. There were various other mistakes he copied in the 2nd edition of the Crest of the Peacock. (Remember that, by his own acknowledgment 6 of my unpublished paper were available to him.) For example, I made the mistake of attributing the octagon doubling method to Aryabhata. Though I provided my sources, George Joseph, who copied this, did not. So there is no way to justify his mistake. Subsequently, Joseph presented my entire thesis as his own in another conference in National Institute of Advanced Studies, Bangalore in Dec 2000. I walked in when he was making this presentation, and naturally asked him why he was using my work without acknowledgment. He had no answer from the floor, but told me the next day what lie he would invent! To summarise, what happened in 2007 was unmistakably a case of blatant and serial plagiarism. In 2007, following the fraud news, I complained also to PTI, India. I showed them my recently published book Cultural Foundations of Mathematics, and the section in it of the transmission of the transmission thesis. I showed them the earlier news item from 2004 about plagiarism by Almeida et al. as also the subsequent apologies by Almeida. But PTI did a thoroughly unprofessional job for reasons best known to them. They did not investigate the truth, simply asked Joseph for his version, and carried both versions. Joseph asserted that the claim of plagiarism was “Nonsense”. This was published in the Times of India on 20 Aug 2007. But the truth comes out. Joseph was the one talking nonsense, he was the one seeking fake publicity. That is easily proved beyond doubt. Thus, a news item important enough to be national news, MUST be authenticated by a peer-reviewed publication in an academic journal. It is scandalous enough that the Manchester news release was not supported by such a publication in an academic journal. But the actual facts are even more scandalous. For, there was no article even after the news release. Where is the publication in an academic journal to back the sensational news item, Mr Serial Plagiarists? Nowhere! The Manchester news was based on an unpublished paper. It was never published in any academic journal. Worse, the paper has just vanished; it is no longer available even from the Manchester website. How come the paper was not published even after ten years? How did the academic resource needed to back such a major news item vanish so completely? Publishing it would immediately expose the plagiarism in it. If my claim of plagiarism was nonsense as Joseph falsely asserted why did the paper related to the fraud news vanish? Clearly, Joseph was the fraudster supporting blatant plagiarism by piling on the lies! Joseph and his accomplice Almeida are far worse than the ordinary criminals who steal idols, for they stole an important part of the intellectual heritage of India and damaged it in the process. They did it for the sake of the publicity for the third edition of Joseph’s book Crest of the Peacock. They did it for money, for Joseph benefited financially from the sales of the book, and also benefited financially from his false image as a champion of the non-West, when the truth is that he is the one one involved for decades in systematically stealing credit from the non-West. That Joseph planted fake news and backed it with lies shows that Joseph is completely unreliable. By extension, so is his book. After this fraud news episode anyone who trusts the author of that book and cites that tertiary source will be forever marked as a nincompoop by the knowledgeable. Note also the colonised mindset of the PTI reporter. S/he turned my 500 page book, which I took physically to the PTI office into an “allegation”, while an unpublished paper from Manchester remained a “fact”. She did not read even the title or subtitle. In contrast the London Telegraph understood the difference immediately: even without reading the book, just from the title. The fact is that my book was published by Pearson, a major international publisher; this had to be accepted as authentic over a doubtful unpublished article. Besides a book is not completed overnight, so my research had to have long preceded the Manchester fake news. But the PTI reporter did not even bother to check with nearby INSA, about my project, nor did the Times of India, though INSA is right across the road from its office. Nor did either lazy journalist ask me to substantiate the INSA project with documents (now to be posted on this blog). They simply reduced my INSA project to an allegation, and a matter of believing one against the other: the facts be damned. That is Indian journalists and intellectuals tend to (a) proceed on guesswork, not facts, and (b) trust and blindly side with the West and distrust Indians, because of the self-hatred that colonialism teaches. This is exactly what colonial education teaches to create a colonised mindset. It was this mindset that the fraud news knowingly sought to exploit. With this mindset, the repeated thefts of history are an easy matter, and will continue for ever. One can be easily fooled by those one trusts. Like all plagiarists, Joseph and Almeida made horrible blunders while restating my thesis (stated in the Hawaii paper, that the calculus developed in India with a different epistemology. For example, in one of their papers in Race and Class they asserted “the Kerala mathematicians used the floating point numbers”, used in modern-day computers. Ha! Ha! Ha! What a joke! Only complete ignoramuses like the two plagiarists could have thus misunderstood my thesis about floating point numbers in my Hawai’i paper, which was part of a course on C-programming that I was then teaching as Professor of computer science. Realizing their inadequacy (neither of them understands math, or computers, or the original texts in Sanskrit, or Newton’s physics) they tried to play it safe and copied my work verbatim, as much as possible. But that gave them away, for verbatim copying of previously published work, without acknowledgment is the definition of plagiarism. Further, they had conflicting requirements. Joseph also wanted to hide the evidence of plagiarism in the 2000 edition of his book, from my Yuktibhasa paper. So he tried to delete the reference to the Yuktibhasa paper, so he could later pretend he had never seen it. But the two plagiarists are such third-rate scholars that in the Manchester 2007 paper, they left behind crude traces of the attempts to delete that reference to my work. They deleted the reference in one place, but it survived in a later footnote, as “cited earlier” but the earlier citation to my paper is removed! Thieves get caught because of such silly mistakes. And these two have been squarely caught. Some Indian journalists already knew the 2007 news from Manchester university was a possible fraud. The Telegraph science correspondent told me that he knew the news was not backed by any publication, but said he was smart enough to carry it nevertheless! The Telegraph did not publish a retraction. Their editor did not respond to my complaint: apparently the Telegraph is committed to sensational news, even if false. Neither did Indian Express respond. The Hindu responded, but said it was not its responsibility to verify the news it published or correct it. It is also interesting that there has been no public denial of the fraud news of 2007, to date. This absence of a public denial is significant because the Manchester University ethics committee later stated that the fake news report on its site was a media-office mistake, and suggested that its media office should apologise to me. There was no doubt a media office mistake, in giving out a news release based on an unpublished paper. But that was not the whole truth. The media release was prepared by Joseph. How else did the media office know Joseph was an author? Further, Joseph had publicly defended the media release as in his statement to the Times of India, so how could it be only a media office mistake? It was clearly Joseph’s fraud, and a case of blatant research misconduct. But the ethics committee was concerned with defending the reputation of Manchester University, as best possible, not with facts. Since it was undeniable that the news release was a fraud, they thought of this way to wriggle out. Even so, a public apology from the Manchester media office for the media office mistake would have been of some value, if it was actually done. But it is absolutely no good as a private admission. A public fraud must be denied publicly, for that fraud news item still persists on news portals, and still misleads people for which Manchester university must bear responsibility. If Manchester university was serious about its ethics, they should have put out a public retraction, like HT, instead of just removing the item from their website. But they never did so. They just wriggled around using the British system of distributed responsibility in a bureaucracy. Even that diluted admission of a media office error was purely private. They think they can fool me by saying some nice words about me. No, sir, the damage is far more serious and not related to a single person but to all of India, and indeed all the former colonies. At least if Joseph and Almeida had a trace of honesty in them, they should have publicly denied the fake news sometime in the last ten years. They should come clean, at least now. Their deeds will now stink in history for all time to come. One reason why there was no public denial of the fraud news by its originators is also the following. The Manchester website stated that the “research” was supported by the British Arts and Humanities Research Council. In fact, they used my paper both to obtain and justify the grant! This shows the kind of fraudsters they are. A public admission of fraud news would prove that George Joseph and Dennis Almeida knowingly defrauded the British exchequer. But the truth comes out, not only the truth about the theft of the calculus but also the truth about the even more shameful story of its theft. The major national news could not be supported by a publication. In fact, the paper which supposedly backed the news, has vanished completely along with the original press release on the site of the Manchester university. So, how was the AHRC funding justified? Privately, eh? Whatever the British AHRC does, we Indians need to remember this fraud news from Manchester university for ever on each anniversary of independence. The 2007 fraud news blitz initiated by Joseph with the help of his journalistic connections was not a one-off affair. This was serial plagiarism, for an earlier ethics committee from Exeter had warned Almeida against plagiarism, despite the best efforts of Joseph (a trained lawyer) to manipulate the committee with all sorts of lies (see section on chronology below). The fact of serial plagiarism shows it was a premeditated act of deception and theft from the non-West by Joseph who claims to champion the non-European sources of math. This premeditation from day 1 is described in more detail below. For example, the Exeter ethics committee of 2004 had explicitly prohibited the plagiarist Almeida from ever again using the term Aryabhata group to fudge the real authorship of my paper (to which he only contributed one inconsequential paragraph of two sentences). (See, also, Aryabhata conspiracy below.) But that fudging tactic of anonymising my contribution by using the term “Aryabhata group” was a key aspect of the original plan, of Joseph and Almeida, so the plagiarists did it again. The Manchester 2007 paper attributed the authorship to the Aryabhata group, but now gave its affiliation as Manchester University and Exeter University. The accompanying news release clearly identified the group members as George Joseph and Dennis Almeida. So, this was a repeat of a scam already prohibited by an ethics committee in 2004. The repeat of the scam itself shows that the earlier scam too was premeditated, contrary to the false stand taken before the Exeter committee. The scamsters were pretty confident that another ethics committee would again let them off, exactly as the Manchester committee did. The plagiarists understand that Western institutions in general and British universities in particular have issued a license to piracy since their Francis Drake policy: our pirates are good, theirs are bad. After all, so much of Western knowledge derives from piracy, like British wealth, so how can they outlaw it? The earlier case of plagiarism exposed in 2004 adopted the same psychological trick that Indians have formed such a low self image of themselves, after colonialism, that they are dying for praise from Westerners howsoever incompetent. In the case of that earlier plagiarism, the plagiarised article, full of elementary errors, could be published only in an obscure journal run by a family friend of Almeida, called Journal of Natural Geometry. To run me down, this paper in an obscure journal was publicised by George Joseph using another trick. 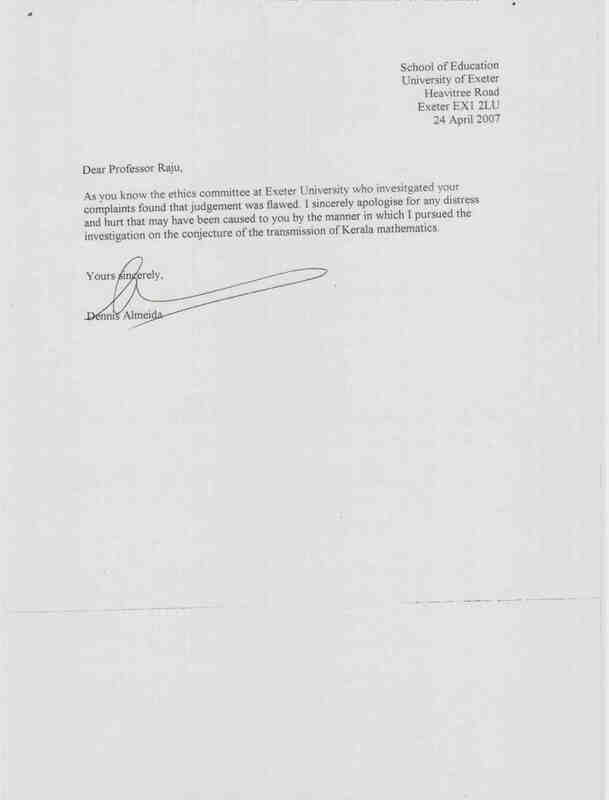 He induced an MSc student, Ian Pearce, to pimp the plagiarised paper through a popular website, St Andrews. Then drew the attention of people like Subhash Kak to that article. The student, Pearce, was thoroughly incompetent; he did not notice the elementary mathematical mistakes in the plagiarised paper, mistakes related to elementary math found even in my geometry text for school children in the 9th standard. For example, the plagiarists mistook solar declination for solar altitude, and Pearce did not know one from the other. The plagiarised paper by Almeida et al. foolishly and repeatedly asserts that solar declination can be measured at sea. Pearce concurred. This mistake is described in more detail in my book, an extract from which is posted here. Solar declination cannot be measured at sea, estimating it requires a good calendar. This was an important aspect of my thesis about Matteo Ricci, a Jesuit who stole calendrical information from Cochin for his teacher Clavius, just before the Gregorian calendar reform of 1582. The incompetent Iain Pearce did not deserve a degree; he should have been flunked in high-school itself, and the award of a degree to him, partly based on this incompetent essay, speaks of the incompetence also of his examiners and the institution. Pearce was also dishonest because in 2004, in the US, he told me a prepared but unintelligent lie about about doing a literature search, when even a google search should have shown up that the plagiarised paper he praised had copied verbatim from my earlier published Hawai’i paper. St Andrews defended the promotion of this falsehood on its site (they anyway promote so many falsehoods about Greeks). They refused to remove the essay from the website or to allow any counter comments warning the reader of the errors, in the essay: that is the way these universities named after saints spread disinformation! They are out to peddle falsehoods to the gullible. More details in a subsequent blog where the full horror story of Joseph’s scams is told,in chronological order. 1“Approximation and Proof in the Yuktibhasa Derivation of Madhava’s Sine Series”.Proc. National Conference on Applied Sciences in Sanskrit, Agra, Feb 1999. Cited in footnote 3 and 48 of Trivandrum 2003. This footnote which cited both the Yutibhasa paper and the Euclid paper is deleted in Manchester 2007 in an attempt to pretend that Joseph lacked access to these papers (from which Joseph copied in Crest of the Peacock 2nd edition). However, the slip shows, since in Manchester 2007 this paper is cited at footnote 53 as “cited earlier”. 2“Kamâl or Râpalagâi” in Indo-Portuguese Encounters (ed) L. Varadarajan, INSA, New Delhi, Universidade Nova de Lisboa, Lisbon, 2006, vol 2, pp. 483–504. Also, final version in Cultural Foundations of Mathematics, chp. 6. (Paper presented at the Indo-Portuguese conference INSA, 1998.) This paper is cited 7 times in Trivandrum 2003 in footnotes 5, 12, 13, 14, 18, 19, 20 and 5 times in Manchester 2007, in footnotes 5, 16. 23, 24, 25 (but zero times in Almeida and Joseph’s Race and Class paper). 3“The Mathematical Epistemology of Sunya,” in: The Concept of Sunya, (Ed) A. K. Bag and S. R. Sarma, IGNCA, INSA and Aryan Books International, New Delhi, 2002, 168–181. Summary of interventions at the conference on sunya, INSA, 1998. Cited at footnote 13 in Trivandrum 2003 and footnote 14 in Manchester 2007. 4“Interactions between India, Western and Central Asia, and China in Mathematics and Astronomy,” in : A. Rahman (ed) Interactions between India, Western and Central Asia, and China, PHISPC, New Delhi, 2002, 227–254. (Paper prepared in 1998 for PHISPC meet. Cited at footnote 15 in Manchester 2007. Used without acknowledgment in Crest of the Peacock 2nd ed., as clear from copying of mistakes. 5“Computers, Mathematics Education, and the Alternative Epistemology of the Calculus in the YuktiBhasa”, Philosophy East and West, 51:3 (2001) 325–362. (Invited plenary paper at the 8th East West conference Hawai’i, Jan 2000.) Cited at footnote 8 in Manchester 2007. 6“How Should Euclidean Geometry be Taught”, in Nagarjuna G. (ed) History and Philosophy of Science: Implications for Science Education, Homi Bhabha Centre, Bombay, 2001, 241–260. (Paper presented at the conference at the Homi Bhabha centre, Feb 1999 where I first met Joseph.) Cited at footnote 37 in Trivandrum 2003. This entry was posted on Tuesday, August 15th, 2017 at 5:11 pm	and is filed under History and Philosophy of Mathematics, History and Philosophy of Science, Science and Society, Uncategorized. You can follow any responses to this entry through the RSS 2.0 feed. You can leave a response, or trackback from your own site.